If it is a Group Tour you are interested in, you are at the right place, as we specialize in arranging memorable tours for our clients. The team at KP Guest House will ensure that you have just the kind of Group Tour you always wanted, as per your needs & budget. Our team has wide expertise & experience in organizing all kinds of tours for a small, medium size or large group even. The kind of Group Tours we organize may include spiritual holidays, adventure getaways, heritage or educational trips & so on. 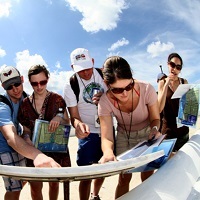 Get in touch with our travel professionals and have the best Group Tour experience.